Children in foster placement often face care on a fractured path, but when they also have an intellectual disability, the challenges are greater and social workers require a deeper understanding of their special needs. Successfully navigating the foster care system is difficult for biological and foster families, social workers, advocates, and especially the children. "One of the biggest challenges that children in foster care face is the lack of stability and continuity with regard to foster home placements, education, and medical care," explains Tiffany McDonald, LSW, social worker at the Cincinnati Children's Hospital Medical Center CHECK Foster Care Clinic. For example, children in foster care often rely on urgent care centers and emergency departments for their primary care, McDonald says. "Or they have multiple providers as a result of multiple foster home placements," she adds. "Another challenge is children in foster care are provided insurance coverage through Medicaid. Many providers do not accept Medicaid, which makes it difficult to access appropriate services." Additionally, maintaining educational services or even something as seemingly simple as school attendance can be all but impossible, at least initially. "Although school placement does not always change with a change in placement, when it does, it can take up to 30 days for new enrollment to be completed," McDonald says. For any child, these obstacles and delays can significantly impact his or her continued progress. However, when that child has an intellectual disability, the challenges can become even greater. One of the concepts to understand about a child with an intellectual disability in foster care is what it means to have an intellectual disability. "Intellectual disability is what we used to call mental retardation, which is a term that has fallen out of favor," says Elizabeth Lightfoot, PhD, MSW, a professor at the University of Minnesota School of Social Work. She notes that people often lump together intellectual disabilities with developmental disabilities, but "developmental disabilities is a broader category. Intellectual disability refers to impairment in intellectual functioning and adaptive behavior," she says. "An intellectual disability is a type of developmental disability, but there are other types of developmental disabilities that do not involve any intellectual limitations." According to the American Association on Intellectual and Developmental Disabilities (AAIDD), individuals with intellectual disabilities are significantly limited in intellectual functioning (intelligence) and adaptive behaviors, as Lightfoot noted. "Adaptive behavior," AAIDD explains, "is the collection of conceptual, social, and practical skills that are learned and performed by people in their everyday lives." This can include an understanding of money, time, social skills, health care, and safety, among other things. Functioning for a child with an intellectual disability can range greatly, and sometimes the disability is coupled with other disabilities/issues, but not always. This can make it difficult when a child enters the foster care system. "Intellectual disability is one of those areas where the children do not fit neatly into a category," says Nancy Fagan, LCSW, director of Child Welfare Services for the Jewish Family and Children's Service (JFCS) of Greater Philadelphia. In Philadelphia, foster care is divided into various categories, including general, therapeutic, and medical. "The children with intellectual disabilities may not fall neatly into any one category," she says. "A lot of the children we deal with are preemies and are diagnosed with failure to thrive. They need early intervention to prevent or try to make the intellectual disability as minimal as possible. But some of the children might have Down syndrome. That could become a medical diagnosis. "But if it's a child just being labeled as having an intellectual disability and they don't have behavioral or medical problems, they could just go into a general foster care," Fagan says. However, since most children with intellectual disabilities do not have only an intellectual disability, it is the agency worker's job to ensure, through continual assessment, the child's needs are being met, she adds. When a child with an intellectual disability enters foster care—of any kind—the ideal situation would be that he or she is placed with a family knowledgeable about working with people with disabilities. "Children with intellectual disabilities in foster care typically have special educational, vocational, employment, mental health, and permanency needs. They must be provided timely and comprehensive evaluations and receive all of the high-quality services recommended to address their needs," explains Laurie Bensky, MSW, senior policy analyst at Children's Rights. "It is important for children with disabilities to be placed with specially trained foster and adoptive parents, and for those parents to receive ongoing support." However, that is not always the case. "There are probably some places that really train their foster parents about disabilities," says Lightfoot, "but it's nothing that all parents receive." Fagan agrees, citing, as reasons for this, the variations in types of foster care and, thus, foster parents, as well as the immediacy of many of the placements her organization completes. "Almost all of the referrals we receive are emergency [referrals]. Very few can be planned. We did recently get a referral for a baby with Down syndrome in the hospital. That's more of a planned placement, but most of the children that come into care [are emergency placements]." That's not to say that the placements aren't made with a great deal of thought. Fagan describes the placement process as an extremely individualized practice that looks at both the child and the prospective foster parents. Age of the child, the number of children already in the foster home, and the problems the family believes they are able to deal with are all taken into account. However, that does not guarantee that the foster family is trained in working with children with intellectual disabilities and their unique needs, particularly when it is an emergency placement. This lack of training for foster parents can affect the continuity of high-quality care received by the child. Take, for example, individualized education programs (IEP). "All of these kids [with intellectual disabilities] will have an IEP," Lightfoot says. "We know that if you have a parent involved in the IEP, the outcome is better. But oftentimes, the foster parents don't know about the details of the IEP, or even that there is an IEP in place. "Parents who have kids with disabilities," she continues, "have to play specific roles in IEP meetings. There's a lot of training available for parents who have children with disabilities to advocate for their children. I would think that foster parents should get the same kind of training. [If they did,] foster parents might be in a role where they could be a great advocate." But it's not just foster parent training that affects continuity of care. As McDonald already described, there are many factors that make up this complicated issue. At the CHECK Foster Care Clinic, McDonald and the rest of the clinic team complete state-mandated medical evaluations for children when they are placed in foster care. "We also provide a 30-day follow-up evaluation in order to complete mental health screenings, developmental evaluations, and ensure a primary care medical provider has been identified," she says. "By the 30-day follow-up visit, we have gathered and completed medical record reviews and will address immunizations and complete [all] screenings. Based on the results of the screenings, we will make appropriate referrals." This process is often complicated by the fact that McDonald cannot always get the records she needs. "I think the biggest challenge is the lack of access to educational records as well as medical records outside of Cincinnati Children's Hospital," she says. "It would be helpful if I were able to have copies of education records and IEP/504 plans so I could provide those to new foster families and review the accommodations. Ideally, our medical director would like to be able to send a CHECK school advocate to go to IEP/504 plan meetings with our new foster families to advocate for them and explain the process." The ideal situation doesn't always happen and social workers like McDonald regularly hit roadblocks, though, she notes, the resources available through positive relationships and collaborations can sometimes ease these roadblocks. Fagan adds that this problem is most prevalent with younger children who are receiving early intervention services. "Certain contracted organizations or certain providers of that service are assigned to a certain region," she explains. "The other challenge is that the birth parents still have legal rights," Fagan continues. "Sometimes, it's an issue of finding them to sign the permission slips or convincing them that these children need the evaluations, because maybe they were in denial. The agency the Department of Human Services may have seen the issue, and that's one of the reasons the children are coming into care. But we have had some cases where we put the child in a foster home and the services all stay. It can get done, and it can get done quickly," she says. However, mastering the outside services isn't the end of the story. It is naive to assume that the obstacles to quality of care lie solely in the services social workers refer to, and not the ones they provide. The case management provided to children with intellectual disabilities in foster care and both their biological and foster families can be equally as complicated. 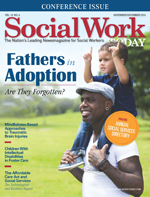 For one, it is not uncommon that there is more than one social worker involved. "If a child has a disability, he/she may have a child welfare social worker, as well as a social worker for his/her disability. They can only get certain services through the disability social worker. They can get child welfare services, too, but the services won't usually last through the child's life. [Child welfare] services by nature are short term. They often have to get services through both," Lightfoot says. How the two social workers coexist professionally varies from place to place. "There are 84 different county units in Minnesota," Lightfoot says. "They all do it differently. Some of them do it with dual case managers. They have two social workers who might go out together to visit the family. There are some places where the child welfare worker goes out by herself and consults with the disability social worker. There are some counties where they just collaborate on everything all the time. "But that's our greatest need," Lightfoot continues, "to have it be more seamless. To determine how the social workers can work together. They can both be huge jobs with lots of different things to know." Even in cases where there are not different social workers for the child's placement in foster care and the child's intellectual disability, there can still be an overlap in services—an overlap that could lead to limitations. In Philadelphia, community umbrella agencies (CUAs) have been created to help families by providing case management close to home. When a child with an intellectual disability is placed in foster care through, for example, JFCS, the child and the child's biological family may already receive case management through the CUA. Typically, Fagan explains, when she receives a referral from the Department of Human Services, her workers focus on the entire system: child, foster family, biological family. However, when a CUA referral is received, the worker is more limited in her responsibilities, focusing primarily on helping the foster parent. With all the challenges, working with children with intellectual disabilities in foster care may seem daunting. But with a bit of advice, success is not only achievable but probable. First, learn. "Working with children with intellectual disabilities in foster care requires individuals to have special training, knowledge, and skills to ensure children have the care they deserve," Bensky says. "Social workers should advocate for the training and supervision necessary to fully understand the issues facing these children and provide them high-quality services. "They should also seek assistance from experts and ask questions when needed," she adds. Lightfoot agrees and encourages social workers to diversify their knowledge. "As there are so many children with disabilities in the child welfare system, it is important for child welfare workers to have a basic level of disability competence." She continues, "but even if a child welfare worker has a basic understanding of disability, they can't know everything and need to know appropriate places to seek consultation." Similarly, social workers who specialize in disability could benefit from understanding the child welfare system. "Child welfare is confusing," Lightfoot says, "and the laws are complicated and constantly changing." She recommends increased training not only for social workers, but for foster parents as well. In addition to increasing knowledge, McDonald reminds social workers to be informed collaborators. "Familiarize yourself with the child's team (i.e., legal guardian, county worker, guardian ad litem, mental health provider, etc.). Familiarize yourself and stay updated regarding current and available resources and services for those children and families served. Be prepared to consistently advocate for the child and family," she says. And that goes for the foster family, too. "I would encourage foster parents to utilize their perspective foster care network agencies," McDonald suggests. "Do not be afraid to ask questions; meet with educational providers regularly as well as medical and mental health providers as recommended. Most importantly, don't wait for 'the professional' to inform you. You are a professional within your rights; seek knowledge and teach others!" — Sue Coyle, MSW, is a freelance writer in Philadelphia.